Wheels are often the first part of a bike to be upgraded. As riders progress, they demand more from their wheels; they need to be faster, stronger and lighter. These are some of the key features to take into consideration when buying a wheelset for mountain bikes or road bikes. Out on the trails, your wheels will regularly meet rocks, drops and jumps, and often at great speed. It’s important that you can rely on your wheels to stay true and spin freely for many miles. Your riding discipline and style will need to be taken into consideration when deciding which wheels to purchase. Cross Country riding is less damaging to wheelsets, and riders will want to save as much weight as they can. On the other hand, downhill riders will need a strong wheelset if they are to get to the bottom of the course safely. If you’re using a bike with disc brakes, you need to ensure the wheelset you choose is compatible with disc brakes. 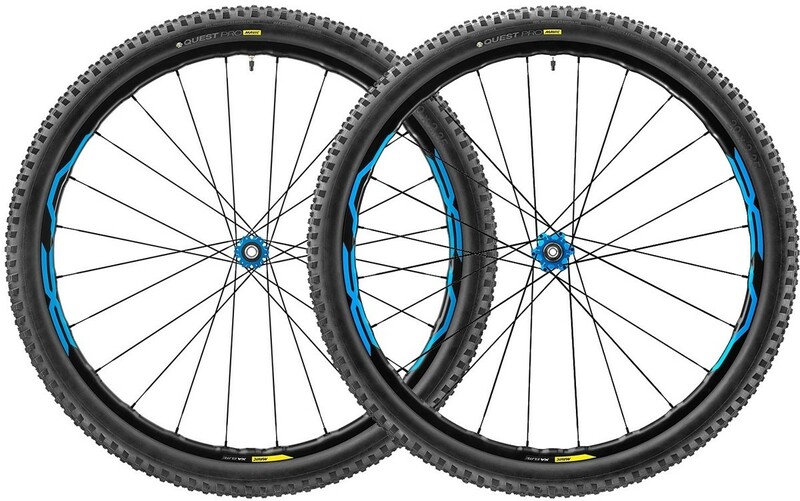 Most modern mountain bike wheelset upgrades will use either the 6-bolt type disc rotor fitment, or Shimano’s ‘Centre-lock’ fitment. These are interchangeable between bikes, however if you opt to change from one rotor fitment to another, you may need to replace the rotors themselves. If your bike uses rim brakes, the rim needs to have a braking surface, which disc-specific wheelsets do not have. Using a disc-specific wheel rim with rim brakes is highly dangerous. With 26, 27.5 (650b) and 29 inch wheels available, it’s important to double check the wheels you’re buying are the same size and fitment as the wheels you’re replacing. The rear wheel hub is available in a wider, and often less obvious range of axle sizes. If you are unsure, you can check the specification of your bike in the user manual, or with the manufacturer online. 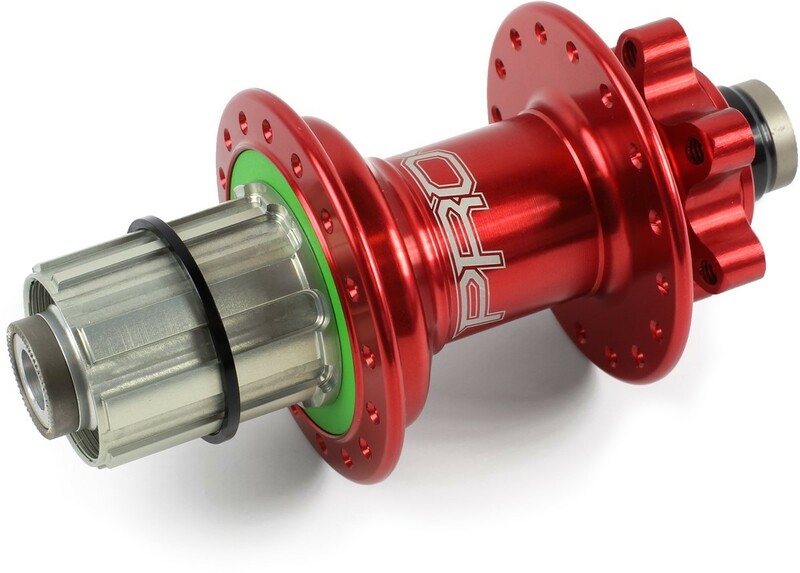 The wheelset diameter and axle fitment needs to coincide with your frame and fork. If the axle is the wrong fitment, you will not be able to safely secure it in the bike frame. If the wheel is a larger or smaller diameter, it may still physically fit in the bike, however the bike’s handling and performance will be drastically compromised. Some manufacturers (like Hope and Halo) provide end adapters which can be used to convert their hubs from one fitment to another. 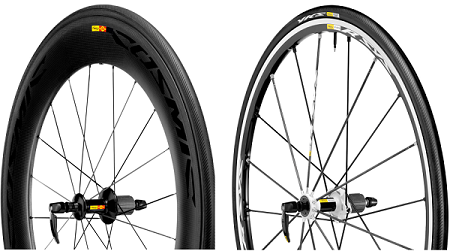 These are ideal if you’re planning to use your new wheelset on more than one bike, as they can be easily converted. One of the first things to consider when upgrading your wheelset is the type of tyres you wish to use, either clincher or tubular. Clincher wheels use tyres with a wire bead to hold them in place on the rim, and are inflated using an inner tube. Tubular wheels use closed-tube tyres which are glued to the rim before being inflated. Though tubular wheels are lighter than clincher, punctures cannot easily be repaired roadside, so they are typically only used for racing. For racing purposes, aerodynamic rim profiles are popular, as they reduce the wind resistance of the bike at speed. These can be identified by a deep-section shape around the rim. Aero wheels may also use bladed spokes, with shallow flat profiles that ‘cut’ through the air. In a straight line, aero wheels can dramatically reduce the wind resistance of your bike, however they are more susceptible to buffeting when riding in a crosswind. Depending on the depth of the rim profile you opt for, you may need also to purchase inner tubes with extended valve lengths, or fit valve extenders to them. If your bike has disc brakes, ensure that the wheelset you’re buying has a disc compatible front hub – ideally it should have the same disc rotor fitment as your current wheels (6-bolt or ‘Centre-lock’), however you can also replace the disc rotors themselves if required. If your bike has rim brakes, the wheelset needs to have a braking surface in the wheel rim. Using a disc-specific wheel rim with rim brakes is highly dangerous. The vast majority of road wheels have a diameter of 700c, with tyre widths ranging from 20-32mm. The width of road wheels may differ slightly to accommodate different size tyres, which can vary between manufacturers. If you have a specific tyre width you wish to run on your bike, we recommend checking with the rim manufacturer which width is recommended. If you are unsure which axle fitment your bike has, we recommend checking the bike’s original user manual, or checking with the manufacturer directly.